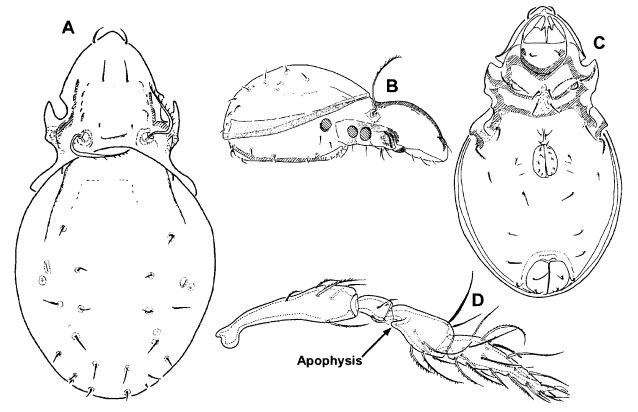 Dorsal (A), lateral (B) and ventral (C) views and leg I (D) of Teratoppia centroamericana, from Norton & Behan-Pelletier (2009). 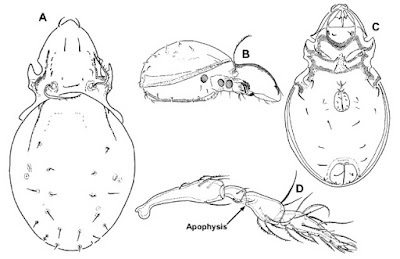 The Teratoppiidae are a near-pantropical group (absent in Australia) of oribatid mites with characteristic expanded tibiae bearing lateral apophyses. Characters (from Norton & Behan-Pelletier 2009): Length 300–450 µm. Gnathosoma normale; chelicerae with dentate chelae, two setae; rutella normally developed. Prodorsum without true lamellae. Notogaster without scalps; octotaxic system absent; dorsophragamata and pleurophragmata absent; paired opisthonotal glands opening directly on notogaster. Epimera III–IV not distinctly delineated, border of epimere III not visible. Genital plates with six pairs of setae. Tibiae I–II expanded laterally, with apophyses; tarsi I–II longer than tibiae I–II; proral setae of tarsi setiform.